Fabric Mart Fabricistas: Made by a Fabricista: Chambray Alder for a Western Themed Auction! 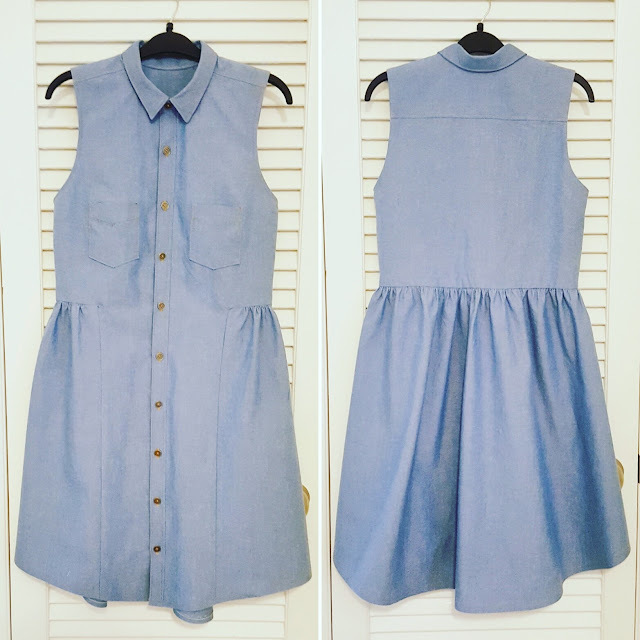 Made by a Fabricista: Chambray Alder for a Western Themed Auction! This is not my first rodeo of making a themed dress for an auction. I have now sewn up four dresses specifically for my school's annual auctions. Last year I wrote up a post for this blog on my "Greek" dress, which you can find here, if you are interested. I heard about this year's theme (BBQ, Boots, and Bidding) super early, so I have known what I was going to make for a long time. I contacted Fabric Mart a while back very excited that I knew EXACTLY what I needed to do for my April make. 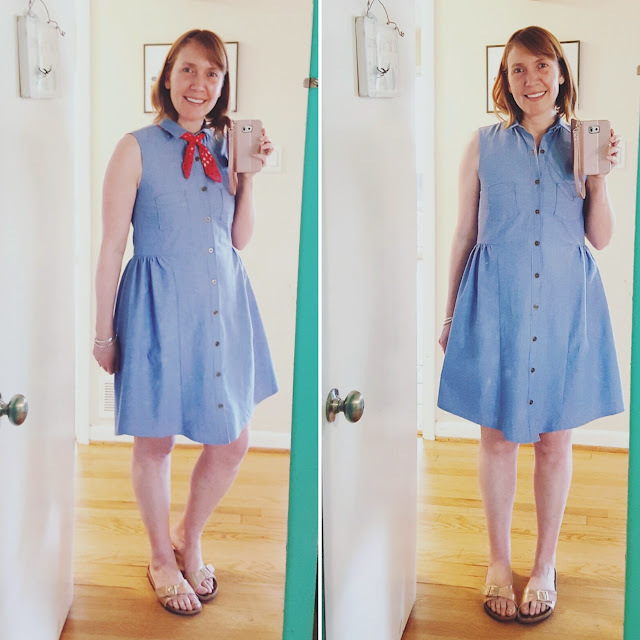 I asked if they had any denim that I could use for creating an Alder shirt dress, and while they had the Grainline Alder pattern in stock (they don't right now, but hopefully it will come back in stock soon! ), they didn't really have much denim, and the yardage that was available was pretty heavy and inappropriate for a dress. 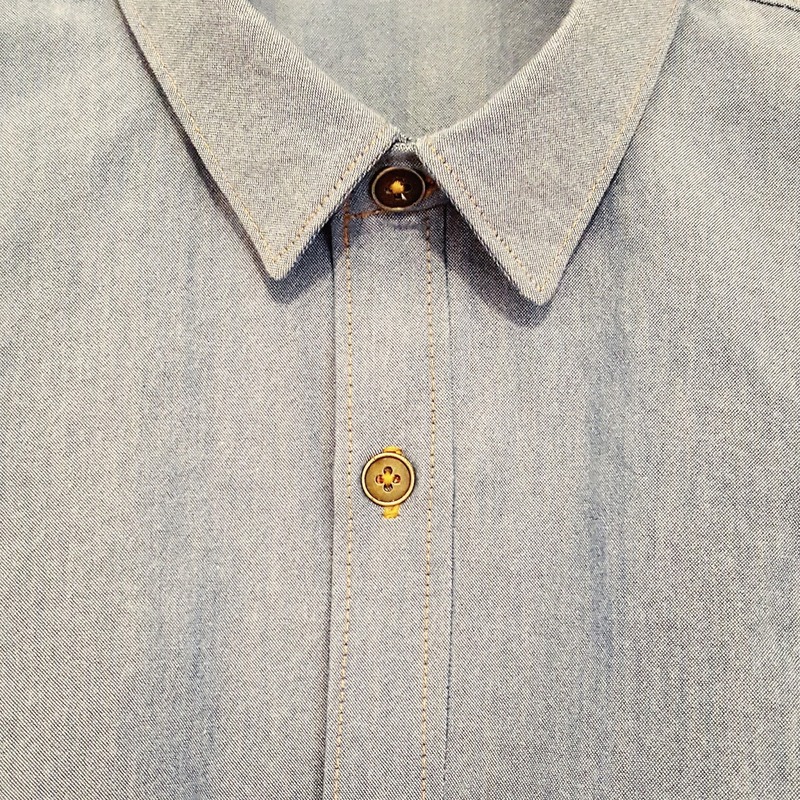 I was sent some images of shirting and chambray yardage that was not currently on the website, and I yelped with happiness when I saw a very pretty medium blue chambray that had a look of denim, but was a lighter weight making it the right fit for the Alder. Shortly after I received both the pattern and the fabric, and a bit before April started, I began the process of creating the dress. I have made many Grainline patterns over the past few years, and I seem to have the body type they design for (I have a fairly small bust and upper body, and the bodices fit well in a size 4 or 6, usually). I decided that I would cut a straight size 4 based on the garment measurements, rather than cutting a 4 and grading to an 8-10 in the hips for skirt portion. Version B of the dress features a gathered skirt that is quite full, so I knew the one area where I am curvy isn't even a factor. If I had made version A (and I have plans for that), I would have likely made up a 4 and graded out to a 10 at the hips and hem. I will say the skirt is super full in this size, and am very glad I didn't cut it the larger size. 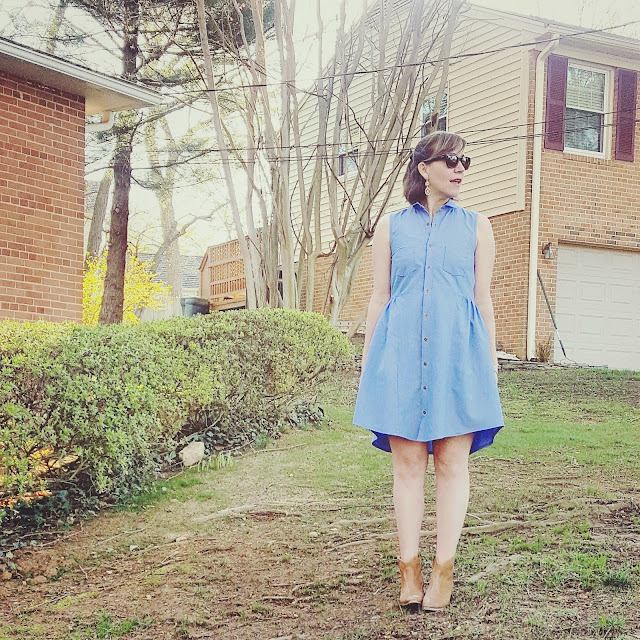 I think this dress can easily look frumpy if it is too big, so the less "pouf," the better. I recommend voraciously reading the Grainline Alder sewalong over at the Grainline blog. I read the entire thing once and then went back multiple times to check I really understood what was meant to be done. The pattern isn't super complicated, but has a few tricky portions, especially with regards to the button placket and the collar. The sewalong has many great images and instructions, and in my opinion, are necessary since the written instructions in the pattern are a bit sparse. I feel like they give just enough to get the pattern done, but they require multiple re-readings to ensure that what is read is really what is meant to be done. I always have to make a straight shoulder alteration, and so I decided to make a size 4 at the neckline, but graded out to the 18 at the shoulder joint. I really like how it fits, but it can wrinkle up a touch when I am not putting my hand on my hip, so I think I could probably reduce the grading out to a 14 instead. 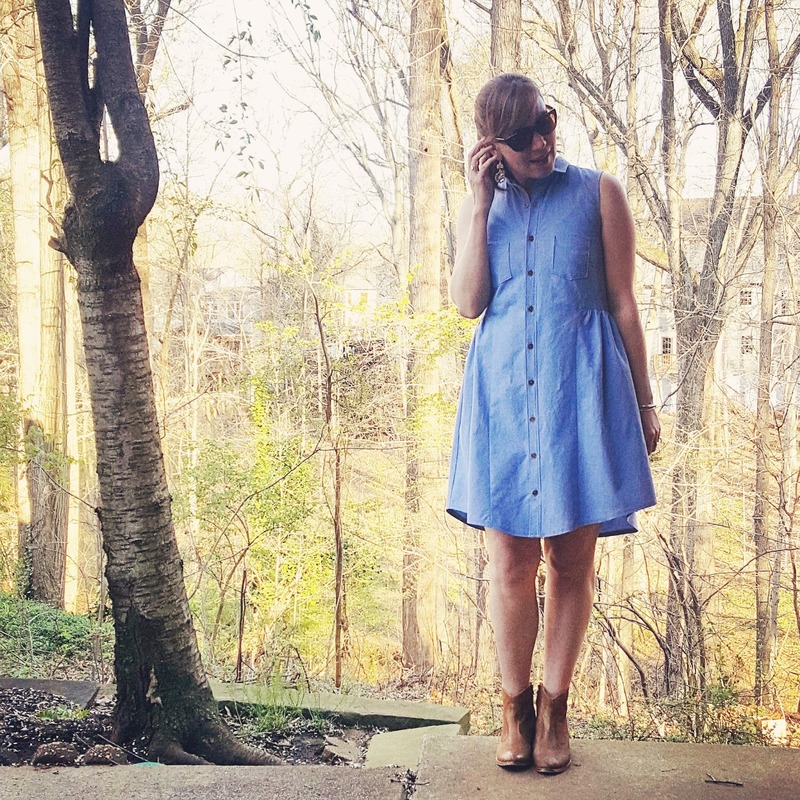 The pockets are cute, and though they won't hold anything more than a credit card or a couple of dollars, I think this rather plain dress needs the interest there. 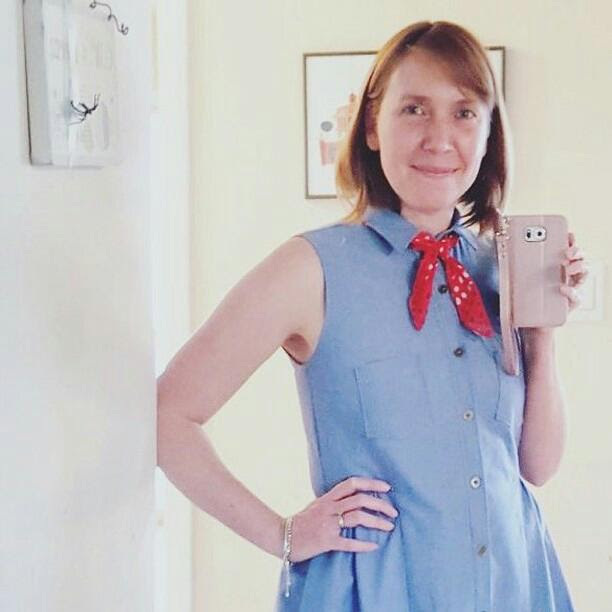 I decided to tie a short scarf at the neckline, and I think it looks cute, so I definitely will be purchasing a red bandana before the auction, so I can really add to my theme look. I don't think I'll go so far as to get a cowboy hat, though. Ha. The buttons I purchased for $5 for 50 from some Amazon seller. It was one of those moments, you sewers all know it...I thought I had exactly the right amount of cute buttons, only to find out I was two short. D'oh. I had exactly two desires, that they be a tarnished gold look, and that they be available next day or two day through Amazon. Both desires were filled, and I think they are utterly perfect for the dress. I was most concerned about the length. I knew that if I were to cut the size 4 length it would have been far too short for my 5'8" frame, so I lengthened it to the size 18 length, and reduced the hem to a 1/2" total. I used an amazing product that Fabric Mart sells, this clear double sided fusible stay tape. You apply the tape (1" in width) to the bottom of the skirt with a dry iron, and once the tape cools, you pull the paper backing off. You are then meant to turn up the hem a full inch and fuse the hem with a steaming iron. I chose instead to turn up the hem a half-inch, and fuse it that way (so the 1" is halved, and both sides of the hem have the fusible on it, instead of only one side of the 1" hem having the fusible). This was the easiest hemming job I have ever had. I LOVE this tape, and will always remember to use it on projects like this where the hem is a bit "odd" requiring more of my energy. The back of the skirt is very long, and hits at the back of my kneecap. The sides go up a bit, and dip back into the front of the dress. I like the style and I think it will be fun to wear both to the auction and later to school (without the boots and bandana, of course). Okay, that's it! I am so glad I was able to share this make with you this month. I had a blast making it, and cannot wait to wear it later this month for real! I'll talk with you all again in June! How cute! I love this dress on you. The denim choice is perfect for this pattern style. You could wear this dress in different ways and fabrics. You look nice! Oh, thank you! :-) I can't wait to wear it to the auction all cowgirl style, but I just know it will be perfect for teaching, too! Ballet flats and a cute printed cardi, here I come!